Are you frustrated with the photo gallery on your iPhone because you can’t seem to delete some of the pictures? Are you looking for the little trash bin icon, but it’s nowhere to be found and you’re not sure how to remove the photos? Or do you delete some photos but when you check, the photos are still on your iPhone? This is actually a common problem, and the fix is fairly simple. The photos are synced from iTunes. If the photos are added into your iPhone because you synced them from iTunes, you’re going to have iTunes remove them. The photos are stored in iCloud. If Optimize iPhone Storage is enabled, you may actually be unable to delete the photos directly on your iPhone, because they are stored in iCloud. How to Fix "iPhone Not Deleting Photos"
1. iPhone Not Deleting Synced Photos? The Fixes! 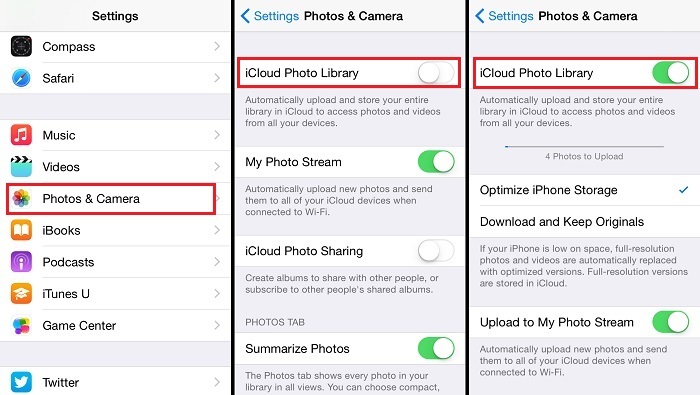 2. iCloud Photos Not Deleting from iPhone? The Fixes! Step 1. Plug your iPhone into your PC or Mac, and open iTunes. Step 2. Click on your iPhone tab in iTunes so that you can see the Summary tab. Step 3. Go to the Photos tab and de-select the photos that you don’t want showing up on your iPhone anymore. Step 4. Click Apply to sync iTunes with your phone. Step 5. Check your phone to make sure the photos are gone. 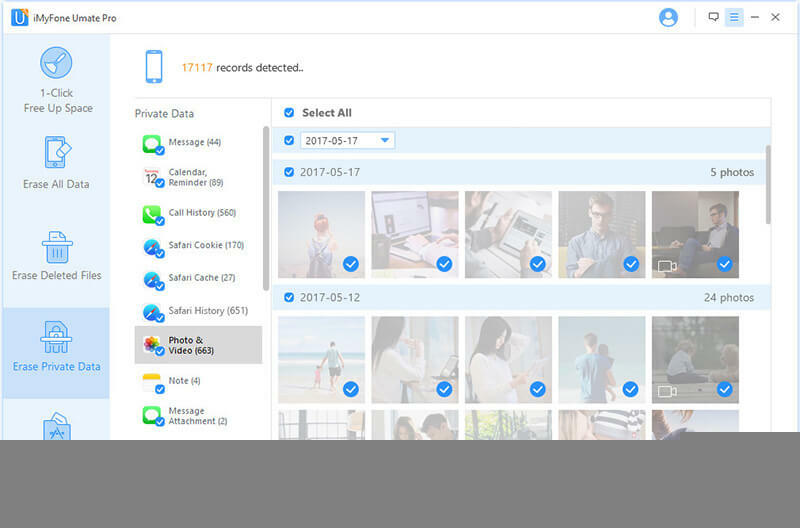 If you cannot access the iTunes you used to synce photos before, or you simply want to have more control over your photos, there’s another way. You can actually delete synced photos without iTunes by using a third-party tool called iMyFone iPhone Eraser for Win/Mac. iMyFone iPhone Eraser is special software that lets you to permanently delete private data from iPhone without zero chance of recovery. Deleting synced photos is much easier than using iTunes. 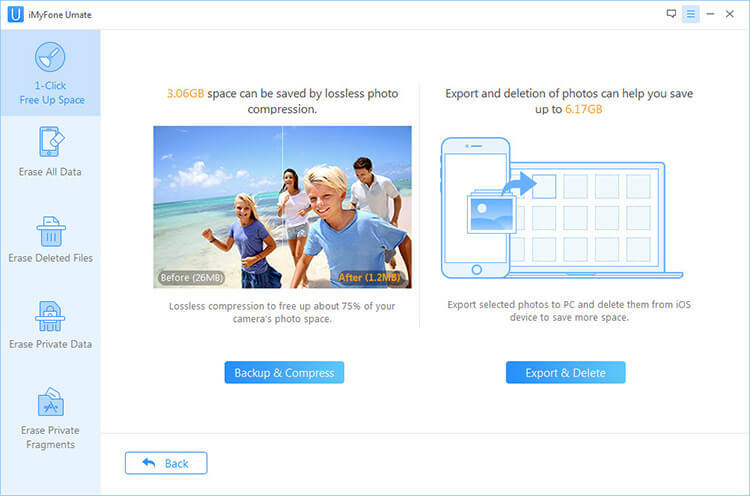 Backup & Compress: Backup all photos to computer and losslessly compress photos in iPhone to save 75% space. Deleted files will be scanned and can be selected to destroyed. Step 1. Download and install the program on your computer and connect your iPhone.. Step 2. Choose Erase Private Data tab and let it scan. Select the photos that you want to delete from your iPhone and click Erase Now button. Step 3. Confirm by typing "delete" into the box. It’s that simple. 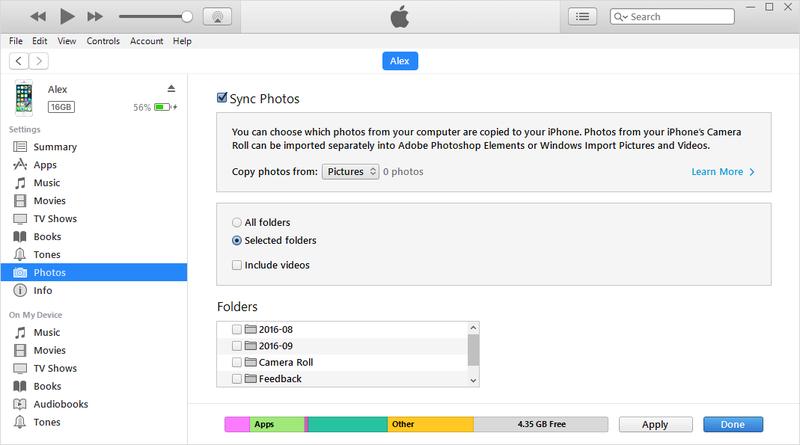 Unlike iTunes, you have full control over your photos and can delete them anytime you want. Why Can’t Delete Photos from iPhone 8/8 Plus? The Fixes! Unfortunately, with iCloud, it’s a little bit more complicated. You can’t delete photos from iCloud unless Optimize iPhone Storage is disabled. Step 2. Select Photos & Camera. Step 3. Uncheck where it says Optimize iPhone Storage and check where it says Download and Keep Originals under iCloud Photo Library. Or you can just turn off iCloud Photo Library. Now you can back up your photos using any method you want. For example, you can use the Backup & Delete function of iMyFone iPhone Eraser for Win/Mac. Yoy won't lose the photos and the photos will be deleted from iCloud. Step 1. Connect your iPhone to computer and open iMyFone iPhone Eraser. Step 2. Click on Photos tab from the home interface. Choose Backup & Delete option. Step 3. Select the photos and click Export & Delete to let it continue. This will backup the photos on iPhone. And your photos will be deleted from your iPhone and iCloud. [2019 Answered] Are Deleted iPhone Pictures Still on iCloud? Why Can’t I Delete Website Data in iOS 11? Here is the Solution!